Welcome to the first of my blog essays – and it’s not as if I planned to write this, it’s just that the idea came to me while I was eating biscuits. One of my favourite ‘fringe’ subjects within tetrapod zoology concerns the alleged ability of eagles to attack and kill unusually large mammals, including people. Most people, and indeed most ornithologists and other zoologists, don’t take this notion too seriously, or indeed dismiss it immediately as utter nonsense. Fortean literature is replete with stories of eagles (usually European Golden eagles Aquila chrysaetos) attacking, killing and/or carrying off people, typically (but not always) young children, with the best known story of this sort being that of 5-yr-old Marie Delex from the French Alps. It’s pretty inconceivable that even the biggest eagle could carry off a human child, but as for whether they could kill one, well, read on. Two recent items in the media have concerned this issue, and both caught my attention. Firstly, we have news from researchers at Ohio State University on the death of the Taung child (or Taung baby, depending on your preference). This is the famous juvenile australopithecine specimen described by Dart in 1925, and thought to have been a 3 or 4 yr old. Following up on Brain’s observations of 1981 that the Taung assemblage represented an accumulation produced by a large carnivore, probably a leopard, Lee R. Berger and Ronald J. Clarke (1995) showed in Journal of Human Evolution that a large eagle was the most likely killer of the juvenile. The case was good: the assemblage consists of smallish mammals (like mole rats, spring hares and small antelopes), evidence for carnivorous mammals is absent, nick marks corresponding to those produced by eagle beaks and talons are present on some of the bones, and eggshell was also discovered at the site. The new discovery is that nick marks around the orbital margins of the Taung child demonstrate once and for all that an eagle really was the killer. Great stuff – I look forward to the paper. What’s a little odd is that several people have started asking questions about the lifting abilities of the Taung eagle relative to the weight of the juvenile australopithecine (oh, and by the way, the eagle is [I understand] presently a theoretical one – the evidence for its presence is there, but the eagle itself has yet to be found. It has been considered by some workers that the African crowned eagle Stephanoaetus coronatus was the most likely culprit – more on that at another time). This is odd because it was discussed to death the last time there was a flurry of interest in the ‘eagle as killer’ theory. Anders Hedenström (1995) showed in Nature that, given that Stephanoaetus can carry animals weighing just over 6 kg (wow! ), then it would have to have dismembered the australopithecine. Which is fine, given that the specimen is only known from its skull. However, Hedenström argued this based on an assumed mass for the Taung child of c. 10 kg, and that might have been too high. Berger & Clarke (1996) – in an article published on the same page as Dave Martill et al.’s brief note on the possibility of finding medullary bone in non-avian theropods [more on that in another post] – countered that evisceration of the juvenile prior to its carrying was likely, given that large extant raptors commonly do this. This could mean a 30% loss in body weight of the juvenile, thus bringing it close to or within the short-range carrying abilities of Stephanoaetus. It’s also worthy of note that Berger and Clarke brought attention to cases where big living African eagles simply must have lifted animals that weighed more than 6 kg, so this perhaps wasn’t the ‘upper’ lifting limit that Hedenström thought it was. So, to those people who have suggested that the Taung eagle killed the australopithecine there on the spot (oh, I see, coincidentally in the middle of a veritable midden pile of eagle-killed small mammals), I say check out the literature on eagle lifting abilities. Speaking of killing the australopithecine on the spot, this introduces the next thing I wanted to talk about… can a big eagle kill a mammal that’s too big for the eagle to carry? Like it or not - and I’ve received some vitriolic emails for promoting this idea (Naish 1998, 1999) - the answer is a definite yes. In fact the ability of large eagles, specifically Golden eagles, to kill relatively enormous prey is not doubted and well established. Between 1987 and 1989 representatives of Animal Damage Control (ADC) were called in to check out mysterious domestic cattle deaths that were occurring in Socorro County New Mexico. 6 calves were killed and 13 injured, with the biggest calf attacked weighing 115 kg. The attacks were caused, unquestionably, by a pair of local Golden eagles, as verified by observed attacks and by the talon marks on calf skulls. The problem stopped when the eagles were removed (and ‘removed’ probably means ‘shot’ I guess). It seems the eagles killed by puncturing the skull base. I know this all sounds pretty incredible, ridiculous even: if you don’t believe me see Robert Phillips et al.’s 1996 paper in Wildlife Society Bulletin. You might be as surprised as I was to learn that Golden eagles are also documented as killers of Mule deer, Pronghorn and semi-domestic reindeer, and again this is all documented in the technical literature and I’m not making it up. For killing of juvenile deer, see Cooper (1969) for Red deer and Ratcliffe & Rowe (1979) for Roe deer [update: for more info on awesome eagle predation see Steve Bodio's post Blogs, eagles, synchronicity. The adjacent photo is that by-now-familiar image of an eagle kicking the crap out of a fox. For more on eagles vs foxes see below]. What was the second thing in the media that I wanted to mention? On Jan’ 17th, the BBC broadcast 'Bill Oddie's How to Watch Wildlife' (or whatever), and it included something I’ve never seen before on film. Oddie and a colleague were observing a wild Golden eagle in the Cairngorms, and the camera was on the bird too. Suddendly, it swooped down low on an adult Red deer. The deer ran down the hillside, pursued closely by the eagle, which swerved and jinked to follow and harass it. The eagle wasn't about to dig its talons into the deer - it looked as if it was trying to see if it could get it to take a nasty fall down the hill. This behaviour has been mentioned for some other raptors – Lammergeiers Gypaetus barbatus are said to do it to ibex and chamois – but I didn’t know Golden eagles did it. On Lammergeiers, Berridge (1934) wrote ‘A favourite method of dealing with [ibex and chamois] is to swoop down suddenly upon a prospective victim that may be poised somewhat insecurely upon the steep hillside, so that the startled beast loses its foot-hold, and goes tumbling to death in the ravine below’ (p. 219). The scoop is that Lammergeiers don’t just try this out on ibex and chamois, they will also try this on humans too, and I know this because it has been reliably reported by a professional biologist (I don’t have his permission to cite it as a pers. comm., but will try and get this on record). One final thought on this subject, though to be honest it’s not that original and many people end their articles on nasty eagles with the same thought. The raptors I’ve been discussing here aren’t particularly big: Golden eagles max out at 6.6 kg, and Stephanoaetus is less than that. Given that there were, recently, extinct eagles that were substantially bigger than this – Haast’s eagle from New Zealand weighed about 13 kg (in females) for example – then eagles as a group simply must have been capable of even more amazing feats of predation. More on that another time. By the way, the picture at the top isn't a giant killer eagle, it’s me. 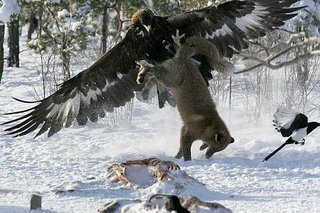 UPDATE (added December 2006): for more on the now famous image of the eagle attacking the fox, visit this post at Birdchick’s site. See also her other post on the subject, where you can watch video footage of an eagle attempting to catch and kill an adult fox. Berger, L. R. & Clarke, R. J. 1995. Eagle involvement in accumulation of the Taung child fauna. Journal of Human Evolution 29, 275-299. - . & Clarke, R. J. 1996. The load of the Taung child. Nature 379, 778-779. Berridge, W. S. 1934. All About Birds. George G. Harrap, London. Cooper, A. B. 1969. Golden eagle killed Red deer calf. Journal of Zoology 158, 215-216. Hedenström, A. 1995. Lifting the Taung child. Nature 378, 670. Naish, D. 1998. Big bad eagles 2: sheep and cow on the Golden eagle menu. Mainly About Animals 36, 10-12. - . 1999. Big bad killer eagles. Fortean Times 122, 48. Phillips, R. L., Cummings, J. L., Notah, G. & Mullis, C. 1996. Golden eagle predation on domestic calves. Wildlife Society Bulletin 24, 468-470. Ratcliffe, P. R. & Rowe, J. J. 1979. A Golden eagle (Aquila chrysaetos) kills an infant Roe deer (Capreolus capreolus). Journal of Zoology 189, 532-535. First, this is without a doubt one of the best blogs ever-- I'll put it on my blogroll immediately. Eagles: curiously, I live in Socorro county near the ranch you mention (Tigner's), know the ranchers, and can confirm that incident (the eagles were subsequently live trapped I believe). So can the Audubon society! Second, I am a writer and falconer and have written a book about my travels among the eagle- falconers of Mongolia. While the most common prey is foxes (Vulpes vulpes & Vulpes corsac I believe) they also take prey that includes roe deer and even wolves! I have seen films and will send you (not very good quality) photos if you wish. Third, roe are a COMMON prey for falconers in Germany and especially the Czech Republic-- taken every year at "meets". MANY photos exist. Finally, a Wyoming biologist I know has seen a wild one taking a pronghorn antelope in the winter. A highly interesting topic indeed. I have already read about the hunting of wolves and deer with eagles, and given the strength of the beak and the claws, paired with the enormous momentum of a big attacking eagle, there seems no reason why big birds of prey should not be able to kill even very large animals, or in some cases even humans. Given the fact that there were besides Cryptoprocta ferox and C. spelaea no bigger terrestrial predators on Madagascar, it would be very interesting to know if the large eagle Stephanoaetus maheryi was probably not only a harpy-alike bird of prey which hunted small lemurs instead of monkeys, but could have been a predator of some giant lemurs like Palaeopropithecus or Megaladapis. Your article was not only educational, but very interesting. However, while I believe your article and references are authentic, I cannot help but think the provided picture has been in some way touched up. 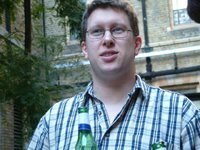 Can you provide any background information of the source of the photograph? Thanks for your comment Salina. The picture is not touched up, is 100% authentic, and is in fact part of a sequence of images. Please see a follow-up post I produced here. Very interesting and exciting article. I read it in Tetrapod Zoology with other photographs and it is really great. You have chance to find this kind of scinery in northern countries which nature was not so demaged. It is difficult to have this change to find in many regions in the world, because of human effect on biodiversity. The most common prey is vole for hawks in the Mediterranean Countries. I can send you some photos if you give your e-mail address. I know of an authentic account of a Wedge Tailed Eagle attempting to drive kangaroos off of a steep road/cliff, recorded by a raptor specialist here in Australia. Entirely likely, plausible and proven, no footage unfortunately. His specialty is Peregrines, but knows his stuff. I live in Boulder Colorado where Golden Eagles are fairly common. On January 30 I was mt. bike riding with my son at Hall Ranch in Lyons and we were observing a Golden Eagle riding the wind above us. We were in a prarie dog village and were hoping to observe the eagle take a prarie dog. I started riding my bike towards my son who was 100 yards ahead, stopped. As I was riding he called out "look out" - at the same time I heard the rush of wind as the eagle flew perhaps 5 to 10 feet over my head, continued down the slope the trail was on and then made a sharp left turn and flew off. I was, understandably, astounded. I've never heard of such an encounter and now researching the 'net I can't find any other instances of a similar incident. Unfortunately we have no pictures. Incredible experience. I doubt the eagle was attacking - it wouldn't have missed. I was perhaps trying to scare me off his hunting grounds.